It seems like all the bridges across the Intracoastal Waterway are movable (and mostly bascule) bridges. The Camino Real Bridge was built in 1939. Architect Addison Mizner wanted to make Camino Real a grand boulevard and planned for a Venetian-style bridge across the Intracoastal. 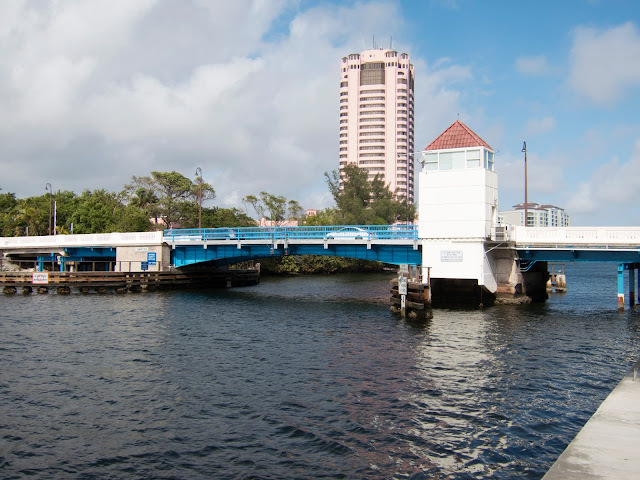 Unfortunately, Mizner's company went bankrupt and the development of Boca Raton was taken over by Clarence H. Geist who built a temporary swing bridge at the site. It was replaced with the current bascule bridge by the Public Works Administration. The bridge is in poor shape and the County planned to replace it, until they found that it had been listed on the county Registry of Historic Places. A $6 million rehabilitation is now planned for 2013. Palm Beach County, Florida Bridges: Camino Real Bridge across the Intracoastal Waterway (2) by Mark Yashinsky is licensed under a Creative Commons Attribution-NonCommercial-NoDerivs 3.0 Unported License.